The Messenger of Allah, Hazrat Muhammad (pbuh) is certainly the most perfect man of all times. He is the perfect example of humanity and he is also the best and the seal of the prophets. The degree of his mercy is beyond compare and invaluable. He surpasses all men as an individual. Allah says in the Holy Quran: “And We have not sent except as a giver of glad tidings and a Warner to all mankind, but most people do not understand.” (Surah Saba, 34: 29). To better understand the degree of perfection of Hazrat Muhammad (pbuh), the Seal of the prophets, one must first know the situation of his country, i.e. pre-Islamic Arabia, well before his advent on earth. Long before the birth of the Holy Prophet Muhammad (pbuh), the pagan Arabs who were idol worshipers lived in ignorance (Jahiliya) and discord. They were torn apart by tribal wars (i.e. wars/ fights between tribes) and lived under the rule of the powerful. Immorality invaded the society. It was everywhere; there was no faith, no law. Alcoholic drinks, games of chance, dancing, usury (i.e. the action or practice of lending money at unreasonably high rates of interest), prostitution, the killing of little girls - at a very young age; in short, the worst of cruelties and brutality were practiced. Moreover, they worshiped idols of different forms, forgetting the One True God, the God of their ancestors, Hazrat Ibrahim and Ismail (as). In the course of time, they abandoned the worship of Allah, and implored statues called Al-Lat, Al-Uzza, and many others, believing that they (i.e. these false gods) had the capacity to give everything to them: children, healing, fortune etc. 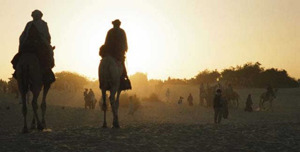 When the general, physical, moral and spiritual situation of the Arabs and humanity as a whole reached the zenith (the peak) of decadence, then God the Almighty, Allah (swt) sent the most perfect and the most noble of the prophets in this world to bring back those humans who had become like animals towards humanity, morality and spirituality. As a result, around the year 570 of the Christian era, a great little human being was born - Muhammad (pbuh), the Messenger of Allah. He lit by the Grace of his Unique Creator, Allah, the torch of piety and salvation. He broke the chains of this absurd (stupid) ignorance and provided the whole world with a beneficial message. 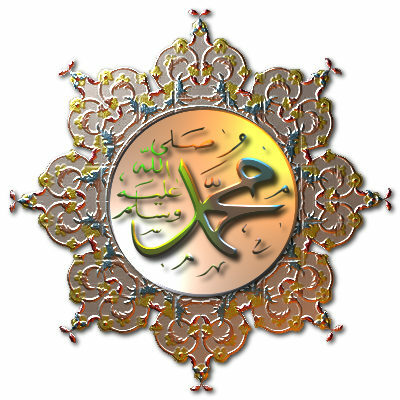 Muhammad (pbuh) was a man with a noble and exalted mission. His only mission was to unite men behind the worship of one God (Allah) and teach them the way to an honest and upright life according to the laws and commandments of God. The Holy Prophet Muhammad (pbuh) took into account all stages of the life of man and governed human life from the cradle to death. Muhammad (pbuh) was the first man to initiate efforts to abolish slavery, discrimination and caste. He regarded all men as one body, one family, without distinction or discrimination on the basis of skin colour, race or nationality. For him, the supremacy of man is only in the fear of Allah (Taqwa) and all human beings are the children of Adam (as). Thus, he (pbuh) broke all the artificial barriers created by man. The young people are the new blood of every nation, those who guarantee its survival and the continuity of its existence. Hazrat Muhammad (pbuh) the Messenger of Allah paid particular attention to the youth. He exhorted them to live a pious life and to stay away from the evil forces that can at any time deviate them from the right path. He (pbuh) said: “On the Day of Judgment, Allah will shade the seven of you who were in the following paths. And one of those paths is, “The youth who grew up in the worship of Allah.” (Bukhari). “O young man, I shall teach you some words [of advice]: Be mindful of Allah and Allah will protect you. Be mindful of Allah and you will find Him in front of you. If you ask, then ask Allah [alone]; and if you seek help, then seek help from Allah [alone]. And know that if the nation were to gather together to benefit you with anything, they would not benefit you except with what Allah had already prescribed for you. And if they were to gather together to harm you with anything, they would not harm you except with what Allah had already prescribed against you. The pens have been lifted and the pages have dried.” (Tirmidhi). Certainly, our beloved Prophet (pbuh) was, is, and will always be the perfect role model for the entire Ummah, as well as humanity as a whole. Allah sent such a being who has arrived at human perfection. Although he was also endowed (like any human being) with a weak body of clay, but his soul was enriched with love and spiritual perfection and this allowed the Holy Prophet Muhammad (pbuh) to teach men at the highest level. Thus he knew with Divine help how to bring out a barbarous and ignorant people from barbarism and ignorance and showed them and all mankind the way to physical, moral and spiritual perfection. “I wanted to learn about the life of one who holds today unquestionably the hearts of millions of human beings. 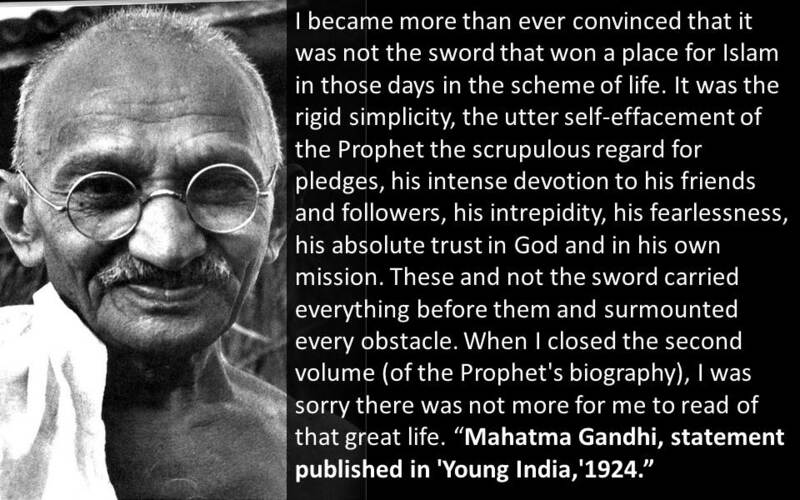 I am now more convinced than ever that it was not the sword that created a place for Islam in the heart of those who sought a direction to their lives. It was this humility, altruism of the Prophet, the scrupulous regard to its commitments, his intense devotion to his friends and followers, his intrepidity, his courage, his absolute trust in God and in his own mission. 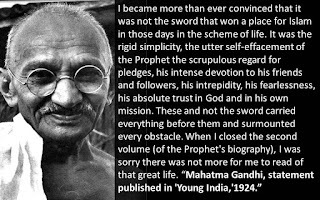 These facts, and not the sword brought him so much success, and enabled him to overcome problems.” (From the journal “Young India”, quoted in “The Light”, Lahore, 16/09/1924). Surely Allah has thought of everything by sending His Messenger, Hazrat Muhammad (pbuh) as the Seal of all the Prophets as well as the Holy Quran as the perfect Law Book, and also Islam as the religion, the perfect way of life of the man. Glory be to Allah, and peace and thousands of blessings on the Messenger of Allah, Hazrat Muhammad (pbuh), and peace and salvation on all the prophets of Allah from the beginning to the end of time. Ameen. ----Sirat-un-Nabi Speech delivered at Tenkasi (Tamil Nadu, India) by Hadhrat Muhyi-ud-Din Al-Khalifatullah Munir Ahmad Azim Saheb (atba) of Mauritius on 22 November 2018 (13 Rabi’ul Awwal 1440 AH).